Carousel sponsorships are an enduring way to honor family or friends, recognize a business, or commemorate a special occasion. 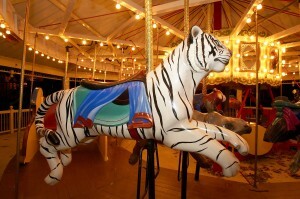 The Endangered Species Carousel, specially designed for Scovill Zoo, features 30 one-of-a-kind, hand-carved animals. Sponsors are recognized with a personalized sign on the selected carousel animal. Sponsors also receive a 5-year Friends of the Zoo membership and free rides on the carousel. Payment options are available! For more information, please call the zoo at 421-7436 to learn how you can make a gift that will last a lifetime. Special thanks to the following carousel donors!